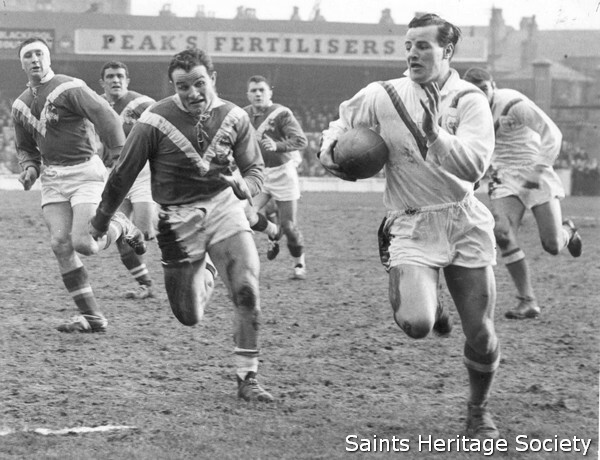 In 1955 the rather small boy of 15 commanded the attention of all the top Rugby League clubs. On the eve of his 16th birthday Alex was smuggled away to club director’s Joe Harrison`s house in Millbrook Lane where he became a Saint for just £80 on the stroke of midnight. Murphy soon made the number seven jersey his own. 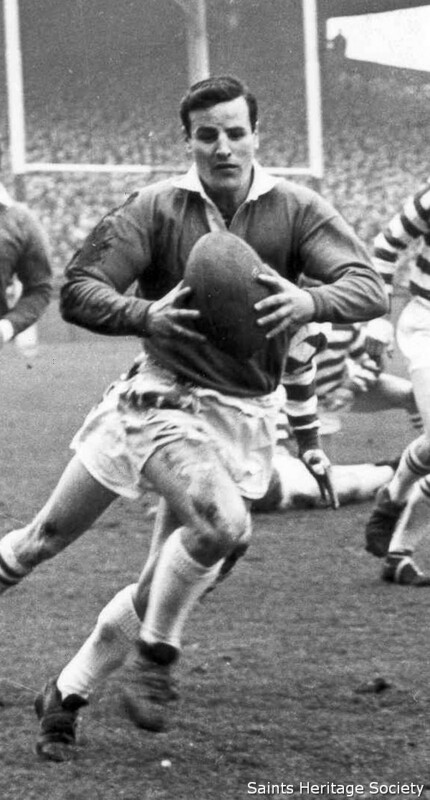 In his first full season, 1957/58, he scorched in for 27 tries. Without even a County appearance to his name the quicksilver Murphy was a shock choice for the forthcoming Australian tour trials. Although he gave himself little chance of success, the selectors obviously believed that speed would be a considerable asset on the hard Australian grounds. Murphy became the youngest ever player to be selected for an Australian tour. The lad from Thatto Heath capped a remarkable success story by being selected for all three Tests. He was in outstanding form as Britain walloped the `Green and Golds` by the record score of 40-17 in the third and deciding Test at Sydney. It was the start of a 13 year international career during which time Murphy made 27 appearances for Great Britain and established himself as the greatest all-round scrum half ever to play Rugby League. Alex was captain of the team for the in the 1964/5 season. His masterful leadership on the pitch and his tactical awareness were streets ahead of other mere mortals. Saints went into the following season with a side brimming with confidence. Murphy guided the Saints to the top of the league and into the Finals of the Challenge Cup and League Championship. 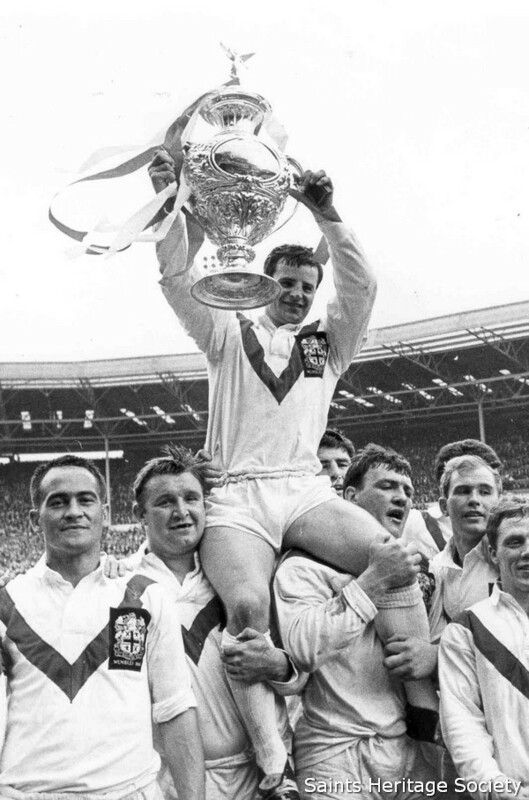 The Challenge Cup Final of 1966 was made a one-sided Final as Alex exploited Wigan`s frailties to implement a game strategy that was unbeatable on the day. His late drop goal demonstrated his ability to kill a game and the amount of time that he always seemed to have with the ball in his hand. That match had repercussions for the sport as the RFL responded with rule changes. Indeed, many pundits claim that the tap penalty and the one-point drop goal were introduced to combat Mr. Murphy`s tactical genius. One week later Alex lifted the Championship Trophy with an emphatic 35 points to 12 victory over Halifax. It was Murphy`s last donning of a Saints` jersey.